8.53 points at 40 votes (rank 24). The game was released for the first time in 1991 for the Amiga and was after that converted to almost all well-known platforms. 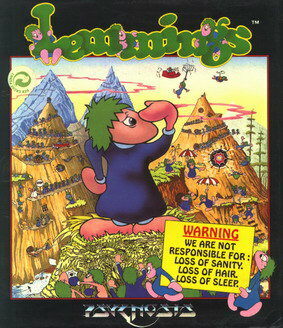 In Lemmings you cannot control the actions of your small friends directly. Instead, you need to lift up some of them to a higher level of the lemming-being by giving them useful skills and talents. Only this way you will succeed in bringing these lemmings (and its friends) unharmed to the exit. To be able to allocate the different skills, choose the corresponding icon from the bar and assign it to the lemming of your choice. As lemmings are not very intelligent, they always walk into the same direction until they meet an obstacle. Then they walk into the opposite direction. 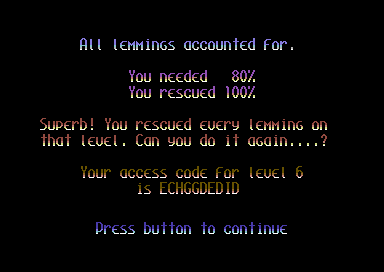 The player has eight options with each a certain number to influence the lemmings. Floater: A lemming equipped with an umbrella can float savely down from any height. If a lemmings has been allocated the umbrella once, it will use it at any appropriate or inappropriate occasion (or sometimes not...). Bomber: You activate the self-desctruction mechanism of the chosen lemming. Above the head of the unlucky lemming a 5 second countdown clock is shown and finally the lemming explodes and leaves behind a cloud of confetti. The lemmings do not like that. Note: This is a possibility to remove a blocker. Blocker: This lemming stands around with arms stretched and blocks the way for its fellow lemmings. Blockers are very patient. They fulfill this function until the time has run out, if you let them. Miner: This lemming instantly generates a pickaxe and starts to dig diagonally downwards into its original moving direction and this until the tunnel is done and it falls out of it. Hopefully onto solid ground. The miner cannot dig through steel. Digger: The chosen lemming instantly starts to dig vertically downwards. When it is throught it falls out of the digged hole. But this lemming cannot dig through steel. A certain number of lemmings needs to be directed into the goal within a certain time. 2D screen that scrolls to the left or right when the cursor adjoins the border of the game section. The width of the section was minimized a bit to avoid time problems during the screen buildup. Great graphics with many animated lemmings and fitting music. Well solved controls by mouse + keyboard or joystick + keyboard. You allocate a skill to a lemming by picking the corresponding icon with a press on the key, then moving the cursor with the help of the joystick or the mouse to the desired lemming and finally pressing the fire button. The corresponding lemming will then start immediately with the allocated activity (e.g. starts to dig immediately etc.). The only exceptions of this rule are the skills of the climber and floater. A lemming that has been allocated one of these skills does only use them when it meets a vertical wall or respectively a cliff. You only have a limited supply of these skills per level. It is shown by the number above the corresponding icon. If the number is 00 you have used up all the supply of this skill. Above the icon bar you see displayed from left to right the lemming type below the cursor, lemmings already freed and still to be rescued, solution in %, minutes and seconds left. After solving a level a password is shown. Write it down, you will get back to this level by entering the password (key "3" in the menu) and you will not have to play the previous levels again. Werner: "Top class puzzle game!" FXXS: "Is as much fun as on the other systems." TheKills: "I have to confess that this part is miles better than many followers... as e.g. Lemmings 3D ;) There all the charme got lost." Ragnarok: "Highlight! To rescue (or bomb, har har) the hairy bustling lemmings is also loads of fun on the C64 - mouse urgently recommended." This page was last modified on 26 December 2017, at 19:26.